Rapid exome sequencing (rES), a blood test that can quickly detect genetic abnormalities, is helping obtain timely genetic diagnoses for critically ill children at Seattle Children’s. 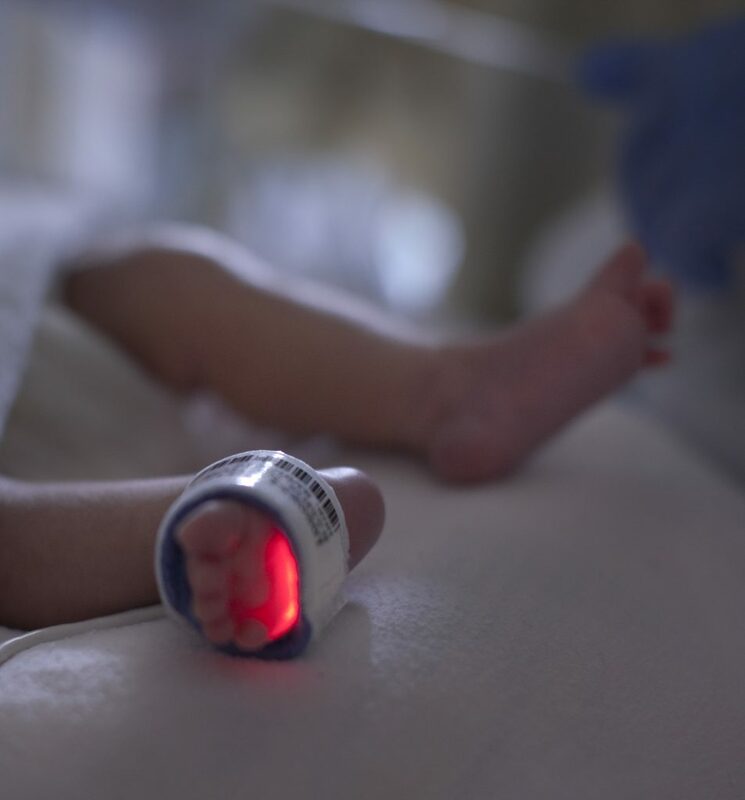 A newborn boy was admitted to Seattle Children’s Neonatal Intensive Care Unit (NICU) earlier this year with arthrogryposis — a condition where an infant cannot move, their joints becoming frozen in place. When geneticist Dr. Jimmy Bennett met the infant, he was on a respirator and could only move his eyes. This family had a previous pregnancy that was similarly affected. Bennett believed the cause might be genetic and recommended rapid exome sequencing (rES) — a blood test that can quickly detect genetic abnormalities. Less than a week later, the test identified a specific condition that led providers to administer an appropriate therapy. Before long, the child was moving. At 4 months old, Raegen was diagnosed with congenital nephrotic syndrome. Early on in Raegen Allard’s life, her mother, Francisca Allard, noticed something wasn’t quite right with her beautiful daughter. Raegen would seem upset after she ate and her stomach was enlarged. She also had a bruise around her belly button, which worried Allard further. At 4 months old, Allard took her daughter to the emergency room closest to their home in Snohomish. They told Allard she needed to be taken immediately to Seattle Children’s Emergency Department. When they arrived they received unexpected news: they weren’t going home. Raegan was admitted to Seattle Children’s Neonatal Intensive Care Unit (NICU). Raegen was diagnosed with congenital nephrotic syndrome, a kidney condition that begins in infancy and typically leads to irreversible kidney failure (end-stage renal disease) by early childhood. As friends and families gather together to observe winter holidays, many follow traditions as part of their celebrations. There are typical traditions, like lighting a menorah each night of Hanukkah, decorating a tree for Christmas, or making resolutions for the New Year. Some families have more unusual traditions, like having a dress-up theme for Christmas Eve or throwing a BBQ for winter solstice, the shortest day of the year. Some traditions instill faith, but whether faith-based or not, practicing tradition is a way to teach values, build relationships, foster a sense of belonging and create positive memories. These are all things that make a strong positive impact on the life of children. Cleft lip and palate is the most common condition Seattle Children’s Craniofacial Center treats. Finding out your child will be born with a cleft lip and palate can be unexpected and distressing for many families. Plagued with questions, parents may wonder if their child will be able to thrive, have speech issues, or what their smile will look like. Dr. Craig Birgfeld, a craniofacial plastic surgeon at Seattle Children’s, enjoys being able to ease a family’s anxiety. At Seattle Children’s, he knows these families are in good hands. Cheerful caroling could be heard through the halls of Seattle Children’s today thanks to two very special guests, Ciara and her friend Kelly Rowland. They surprised patients and families in the inpatient playroom with a holiday concert, accompanied by guitarist Barry Black. But that wasn’t the only surprise they had in store for kids at the hospital. The GRAMMY winners teamed up with Amazon and brought holiday cheer to patients and families in another very big way – with one of the largest Amazon deliveries of the year – a six-foot tall Amazon gift box filled with Amazon Fire HD 7s and Amazon Fire HD 8s for patients at Seattle Children’s. Chad’s Legacy Project has been a driving force behind the first-ever Washington State Mental Health Summit. Laura Crooks (right) and her husband, Todd Crooks, started CLP in honor of their son, Chad Crooks (left), who died tragically months after he was diagnosed with Schizophrenia. Laura and Todd Crooks have experienced personal devastation from losing a loved one whose mental health issues weren’t properly addressed. Their son Chad took his own life eight months after he was diagnosed with Schizophrenia, on Jan. 21, 2016. The professional help the gifted 21-year-old college student required wasn’t readily available when he needed it most. The Crooks have since openly shared their family story in an effort to help others. They also started Chad’s Legacy Project (CLP), an endeavor in memoriam, to advance mental health education and innovations in the evaluation and treatment of mental illness. CLP is realizing its mission, serving as the driving force behind the first-ever Washington State Mental Health Summit, which will take place on Thursday, Oct. 5. A portion of the more than $100,000 CLP has raised is covering the costs of the Summit. Children who participated in the bike train study averaged an additional 21 minutes of exercise per day and increased cycling to school by 45%. The path to healthier living for children could be the same one they take to school. Children who participated in adult-supervised group bicycle rides to and from school increased their moderate-to-vigorous physical activity by 21 minutes per day and daily cycling commutes by 45%, according to a pilot study recently published in the American Journal of Preventive Medicine. The additional exercise study participants gained from riding in the groups, known as bike trains, accounted for 35% of the 60 minutes of physical activity recommended daily for children.